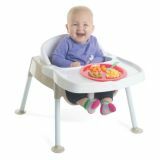 Our stackable tot chair with seatbelt offers comfortable back and foot support. Comes in five sizes that are perfect for any early childhood classroom. Back and side handles for easy pick up by teachers and children. Fully assembled.